Extraordinary White Tuxedo Pants For Men! Home :: Extraordinary White Tuxedo Pants For Men! Mensusa https://www.mensusa.com/articles/extraordinary-white-tuxedo-pants-for-men.html Extraordinary White Tuxedo Pants For Men! White tuxedo pants for men. Variations are unlimited with these sleek, brilliantly tailored white tuxedo pants. Sized to fit in tightly woven, breathable fabric these amazing pants will match your tuxedo jacket perfectly for your special occasion. pants for men are just that. You will not only look special, you will feel it as you walk in the richness of this fashion asset. 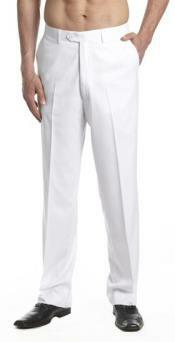 Men's white tuxedo pants are often sought after for wedding or special events. These finely shaped pants are the choice of every man for comfort and wearability. Flat front or pleated, they will move with you in lines of grace and style. The flawless material will flatter any body shape and these pants are carefully sized to fit as though your own tailor customized them just for you. The intricate weave lend magnificence to your tuxedo outfit. Your closet is not complete without them to pair with your favorite tuxedo jacket for all occasions. Available to you today, the world's artisans using silk, cotton or rayon have fashioned our men's tuxedo pants in the purest white. Adding a pair of these to your ensemble will elevate every tuxedo to a higher level of elegance. Suitable for a trip to the theater or the grandest ball, you will turn heads when you arrive in these fine trousers. Combine them with a white or colored vest, slip into your tuxedo jacket and you will be dressed for night! A simple bow tie with well-shined shoes and your outfit is complete for even the most lavish affair! Perhaps just a formal shirt in a color of your choice with your jacket and pants rounds out a perfect ensemble for your event. White is the all-around best for putting your best foot forward and sealing your spot in the top tier of the fashion conscious. These white tuxedo pants for men provide you comfort in all types of weather. Cool or warm, they breathe with your body's temperature. Sturdy zipper adds confidence to your day and ample hems allow for adjustment in length if needed. Varieties include tapered or slight flair to the leg with closely fitted seat and sides. The comfortable waistband can be worn with or without a belt. Wearing these sharp white tuxedo pants for men, your competition will soon wilt with envy. These carefully selected white pants will soon be invaluable as they join the ranks of your favorite tuxedo ensembles. Available in high or short waist, your white tuxedo pants for men will nicely pair with your jacket. Easy to clean, the material marvelously handles spills or dirt. There is no doubt you will want to own one or more of these specially priced men's white tuxedo pants for every occasion. Feel the euphoria of affluence in a finely woven pair of these stunning pants! Hurry to buy in your size now, because at these prices, they will go fast!